This is a histological section of a normal kidney (left) versus a kidney after acute kidney injury (right). Nicotinamide adenine dinucleotide (NAD+) is a major player in nutrition today. Studies have shown that NAD+ concentrations decrease during aging and that recovering the body's levels of NAD+ can prolong both health span and even life span, making it the focus of much research in nutritional science, medicine, and even pharmaceutics. In terms of biology, NAD+ is what is known as a "co-enzyme" - a necessary molecule that helps an enzyme carry out its respective reaction in the cell. NAD+ is a common co-enzyme for multiple metabolic enzymes across all living cells, meaning that it is heavily involved in producing energy and keeping cells alive and healthy. 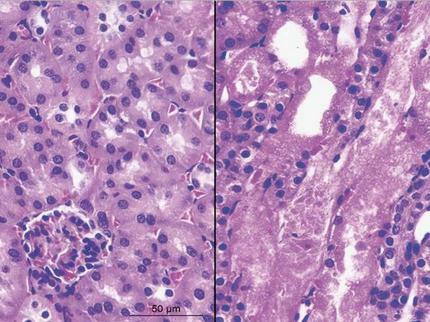 Scientists lead by Johan Auwerx at EPFL's Interfaculty Institute of Bioengineering in collaboration with TES Pharma have found a new way of increasing NAD+ in the kidney and liver by blocking an enzyme competing with its production. The de novo synthesis of NAD+ in the cell begins with the amino acid tryptophan. One of the key enzymes involved in this process is ACMSD, which limits the amount of NAD+ produced by the de novo synthesis pathway. The scientists were able to show that ACMSD controls the levels of NAD+ in the cell through a mechanism that doesn't seem to have changed during evolution: case-in-point, the researchers found that, in both the earthworm Caenorhabditis elegans and mice, blocking the enzyme resulted in higher NAD+ levels and enhanced mitochondrial function. The inactivation of ACMSD also increased the activity of Sirtuin 1, an enzyme that NAD+ works with in its role as co-enzyme. Sirtuin 1 is known to play major roles in mitochondrial well-being, and as a result, the boost of NAD+ levels ultimately enhanced mitochondrial function. The team then used two potent and selective inhibitors of ACMSD, developed by TES Pharma. "Since the enzyme is mostly found in the kidney and liver, we wanted to test the capacity of the ACMSD inhibitors to protect these organs from injury," explains Elena Katsyuba, first author of the paper. Both inhibitors were shown to preserve kidney and liver function in animal models of acute kidney injury and of non-alcoholic fatty liver disease, offering much promise for their future therapeutic potential in humans. "The fact that ACMSD is exclusively present only in the liver and kidneys reduces the risk of negative repercussions of its loss on other organs," says Katsyuba. "Put simply, the enzyme will not be missed by an organ that does not have it anyway." "Given the beneficial health effects of boosting NAD+ levels that we have seen in worm and mouse models of disease, we are looking forward to bringing these compounds soon to the clinic to the benefit of patients suffering from liver and kidney diseases, two areas with a large unmet clinical need," says Johan Auwerx.